Are they testing or something? Race isn't until March. The PCA Club Race is this weekend. Checkered P1 and P2 sessions are already on tonight. I haven't been out yet but the track looks to be VERY rubbered in from what I could see from my trailer (I'm parked in the corner of the turn leading to the turn onto the long back straight). Sort of...several GTD cars and Conti cars and teams lapping here today. it's the annual PCA sponsored porsche only test. I'm across from Bob Woodman with BGB if anyone wants to swing by and say hello. A couple rlisters have already visited. Just released Cayman gears on display as well as our recently reworked G50/Cup LSD and some other stuff. I'll be swinging by Saturday afternoon and dragging my neighbor who is a 993 owner, but not yet a Porsche nut...nor a track rat. I'm looking forward to starting to put the 964 back into track form and getting back to the track and maybe even participate in the 48Hrs next year...we'll see how the stars align. It was fast for night practice. Too bad about half the field seems to have dropped out after they combined groups. Weather looks perfect.......I get in tomorrow. 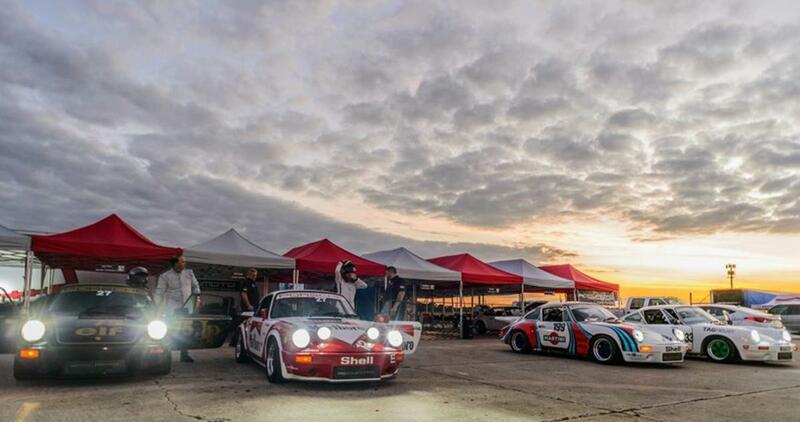 My GMG boys are there with a GT3R and 2 RSR's......looking forward to it and running with Stuart on Sunday. I'm here, just finished night sessions. I'm in Australia but my coach Larry from NNJR PCA had been sending some really cool pix!! Whats with all the strange GT classes? Guys that would normally be in alphabet cars are showing up as GT this and GT that on Race Monitor.